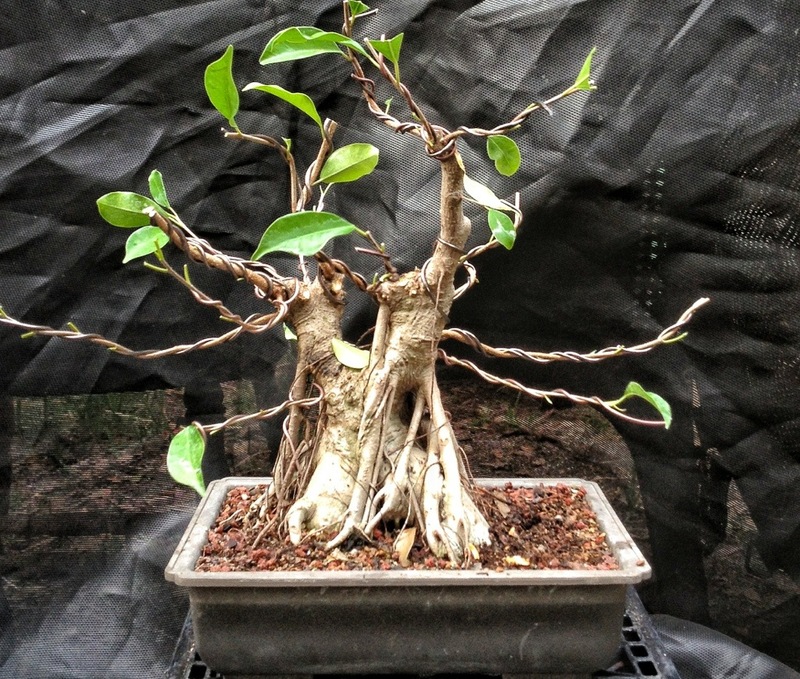 Firstly, I’d like to thank you for reading past the title and at least entertaining the idea that a ginseng or S-curve ficus could be a suitable piece of material for bonsai. I recently wrote a piece (here) that shows what type of growth one could get out of this material. Most people enjoyed it but two people in particular did not. I don’t think these two ever read the post past the title or they would have seen the difference between the raw material and what a little growing out can do. 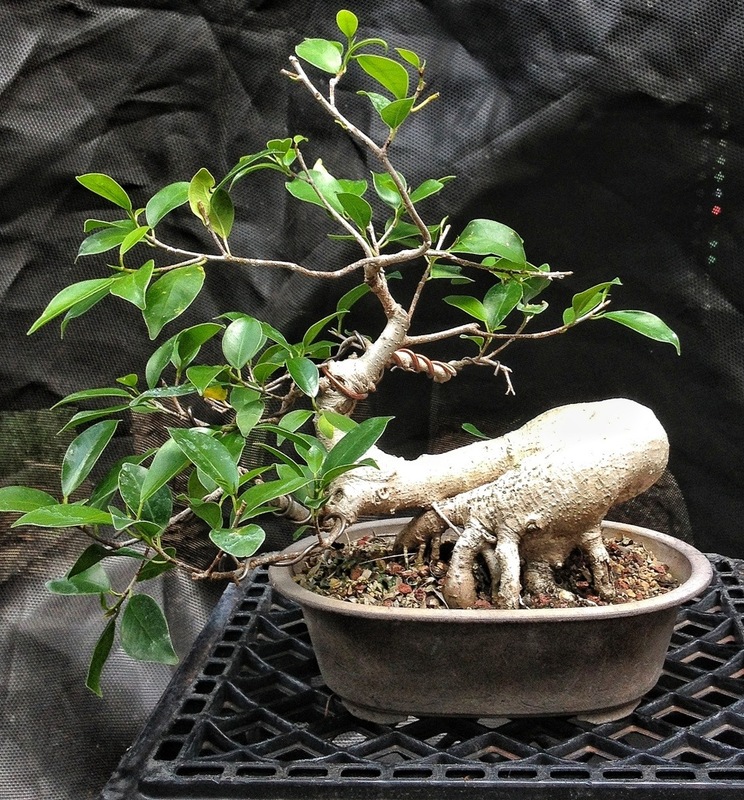 One curmudgeon is from the US and has been in the bonsai community for many years. He’s at the point (after being involved in the many clubs and organizations around the world) where his life experiences dictates what advice or techniques he might share with a novice or intermediate. 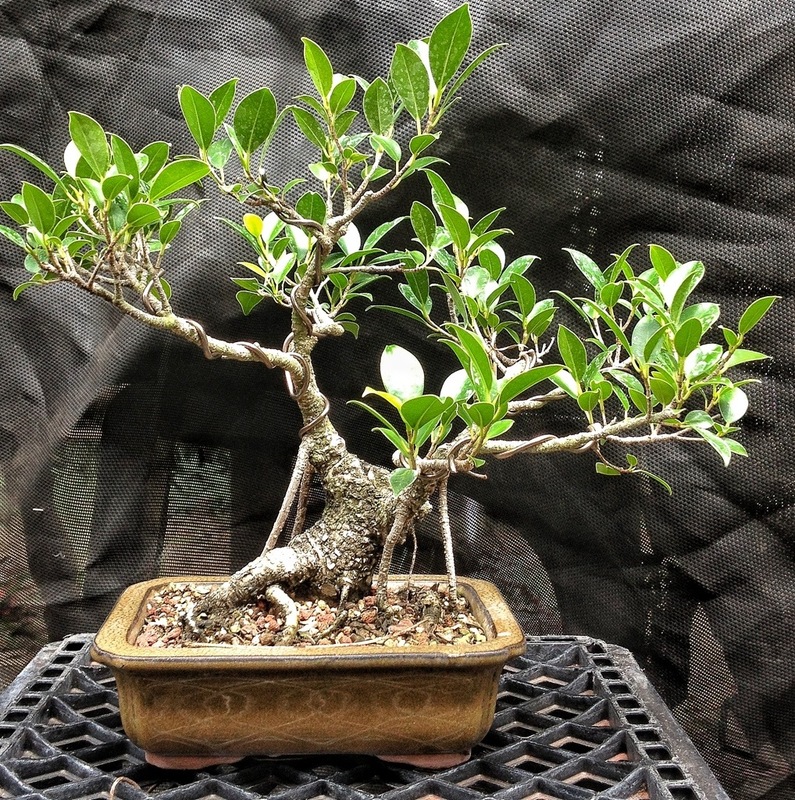 The other bonsai-ist has been practicing (I’m sorry, practising) bonsai many years and seems set in his vision and styling of trees; anything new or different is hard for him to accept. 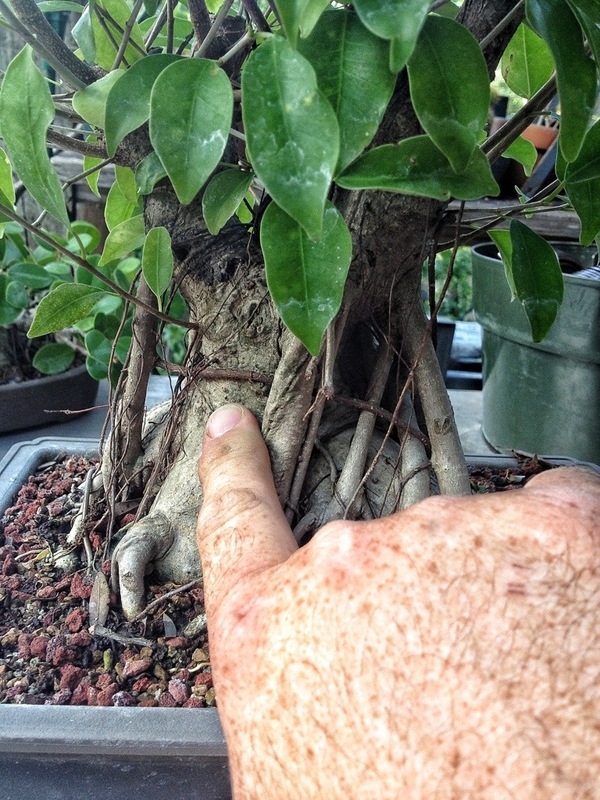 Any variations in plant materials beyond what he sees in his neighborhood are baffling and its hard for him to envision a tree shape in, say, a ficus or portulacaria. 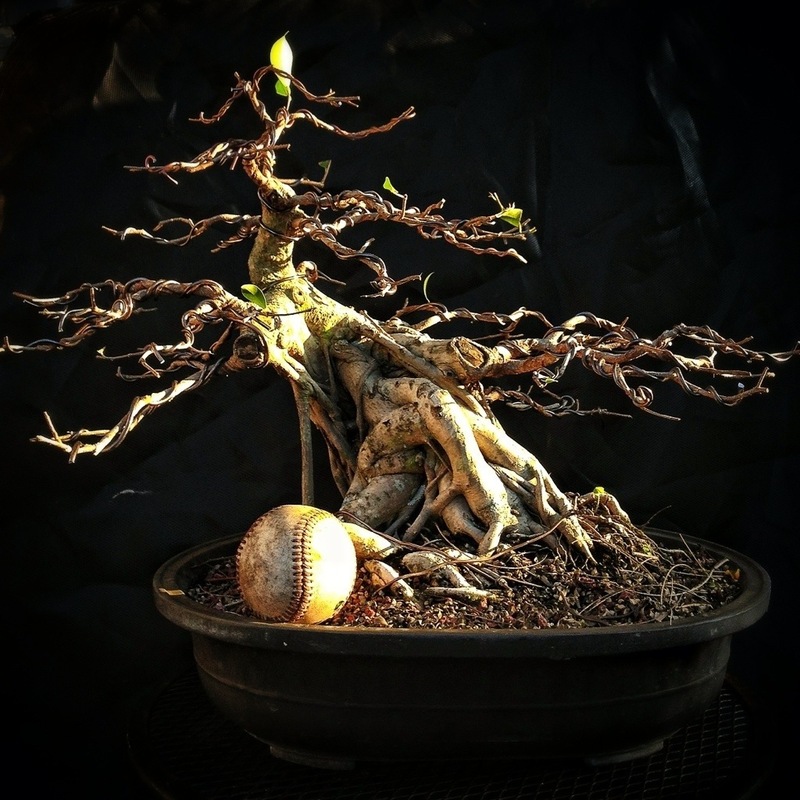 Both of these men have made names for themselves and have been in bonsai for a long while. You know the type of people I’m talking about. It’s almost as though they’ve reached a second “Age of Disbelieving”. Either that or their perspective is, been there, done that, I’m older than you so I know best. I’m here to tell you, it’s neither age nor training nor eminence (or even imminence for that matter; meaning the hot new artist on the block) that bequeaths artistic vision. It’s an open mind. If an artist rejects, out of hand, a piece of material, then he or she may only be a craftsman. Not an artist. 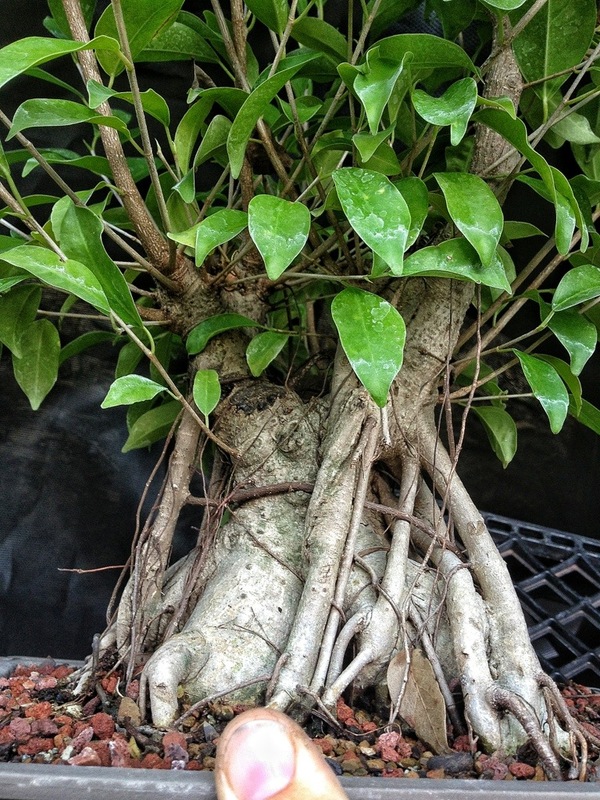 This tree, near as I can tell, was a ginseng ficus. This was done at the end of July 2012. I would say that my operation was a success (it is April 2013). 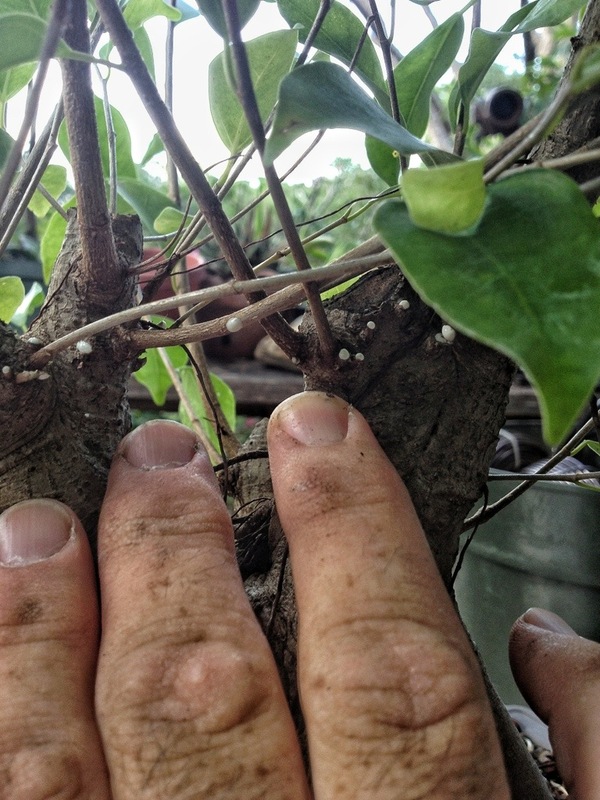 The trunk has thickened, copious branching has occurred, and I now have something to work with. At the chop zones the number of branches is impressive. 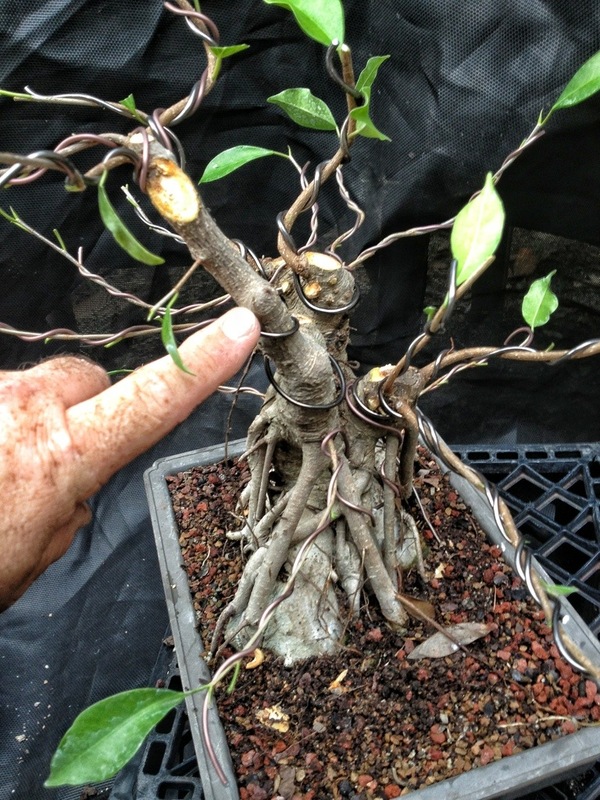 This step in the process will be a matter of simplifying the tree, bringing the shoots at any one area to one or two, and some wiring. The first step is always the roots. You can see the original buttress that has the “ginseng” characteristic. Let’s talk about my theory a bit. 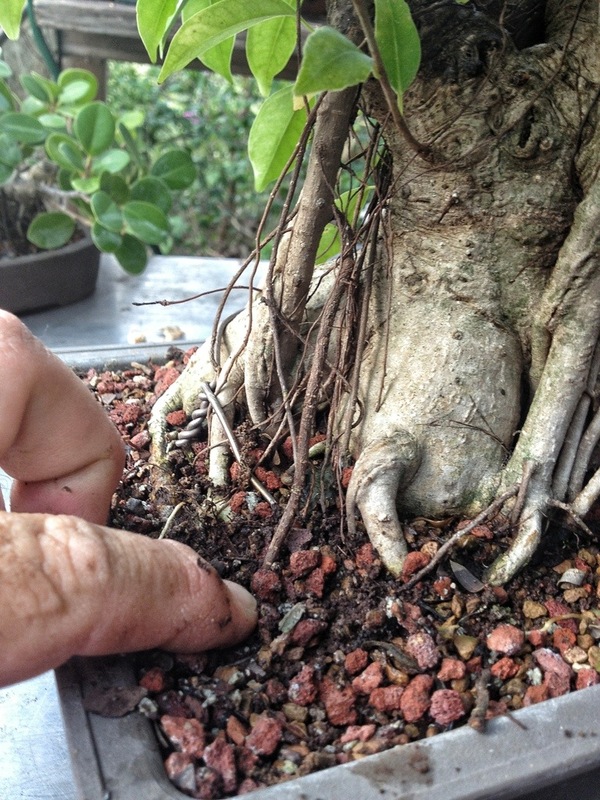 There’s a nursery in Vero beach that is world famous for ficus bonsai. The man who ran the place for many years and I were talking recently. 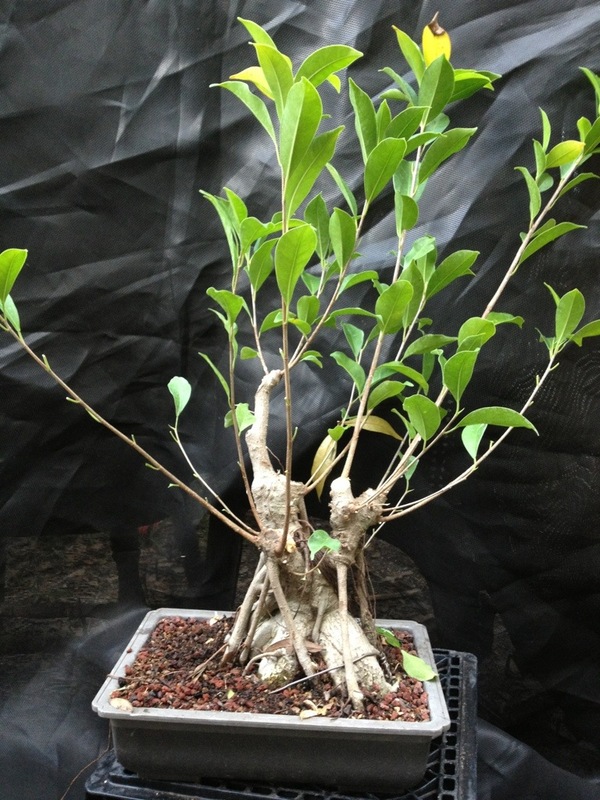 He has been raising seedling ficus for a several years now and he agrees with me that the so-called “ginseng” ficus is just a seedling f. microcarpa. I feel somewhat vindicated. 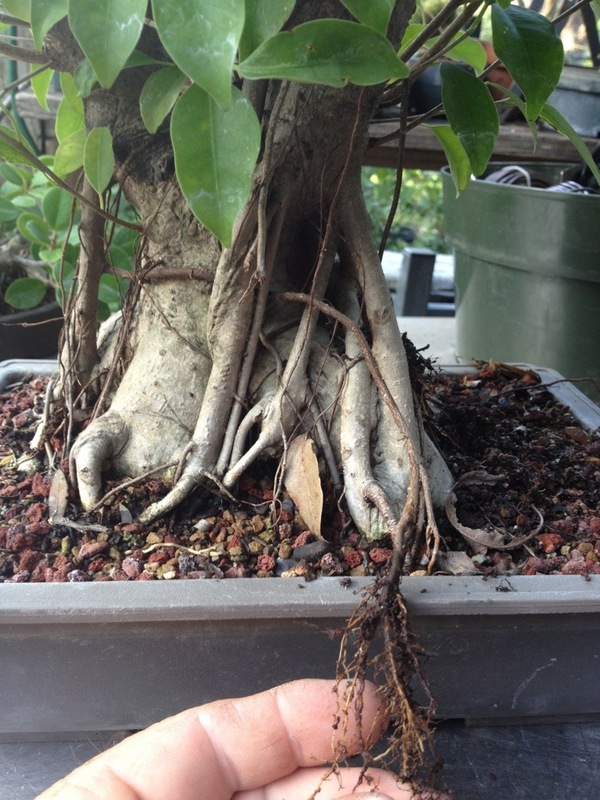 In Florida, when growing ficus, we get aerial roots. There are those who hate them. And those who love them. My opinion is that if a tree puts them down, keep them. But we do have to arrange them from time to time. This is art, after all. And I do this around the tree. 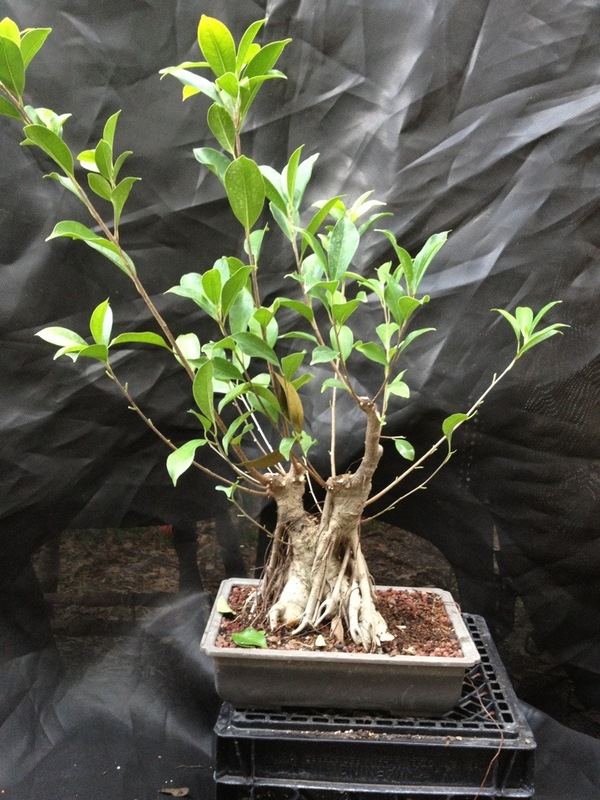 And like I said, it will be a simplifying of the shoots to one or two at each spot I need a branch. Next is wire and branch placement. 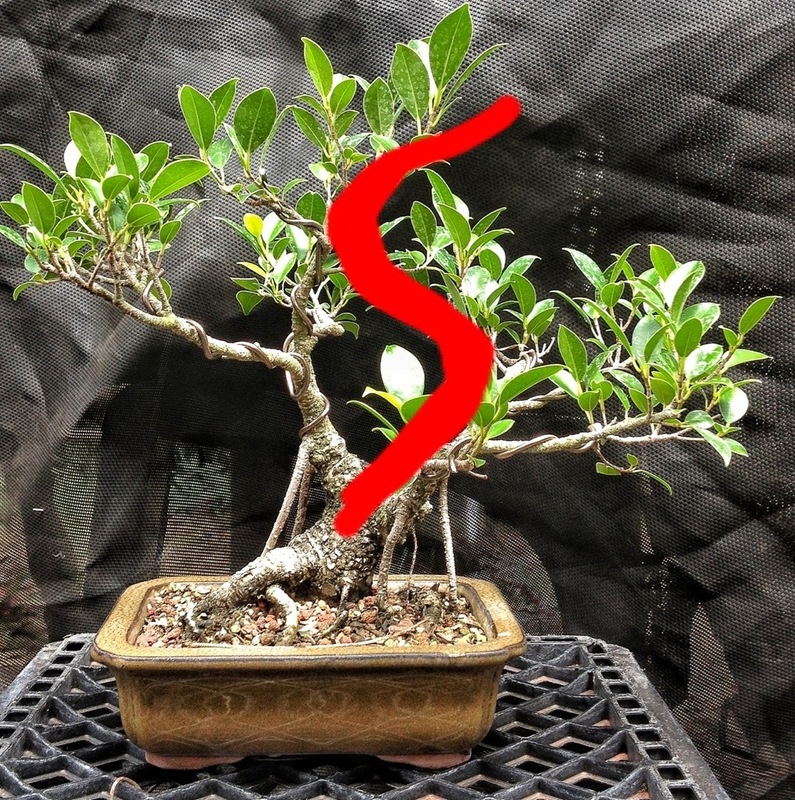 But first, lets talk about the dreaded S-curve ficus. 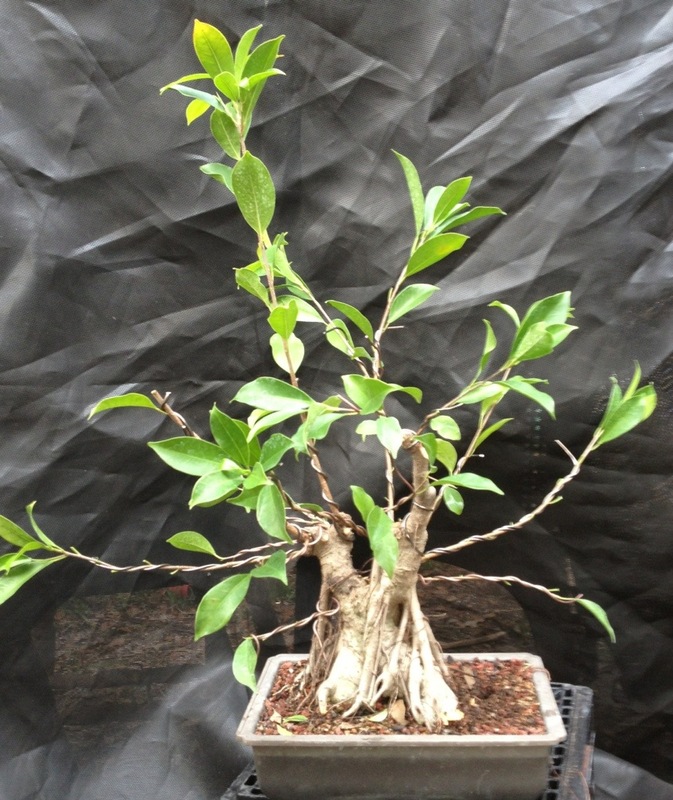 Usually the variety is ficus microcarpa “retusa”. 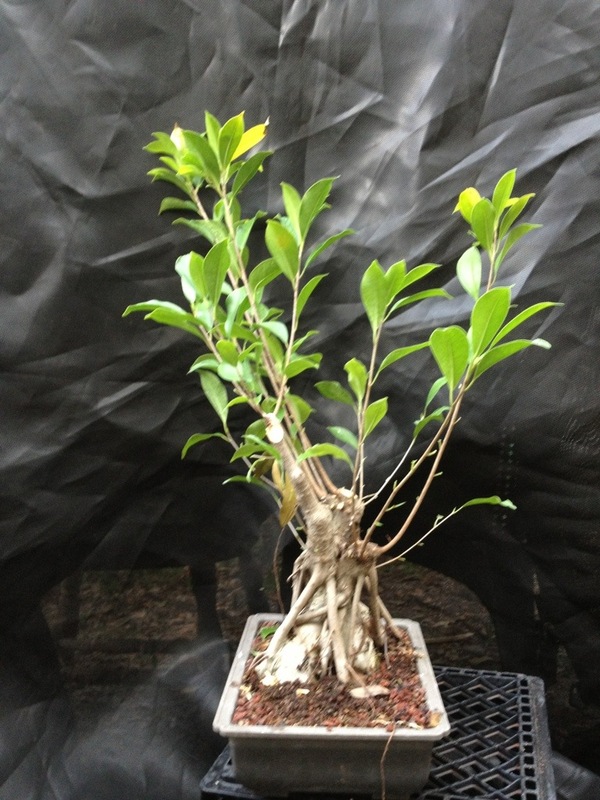 Some common names you may hear are: tiger bark, keman, kingman, golden gate. 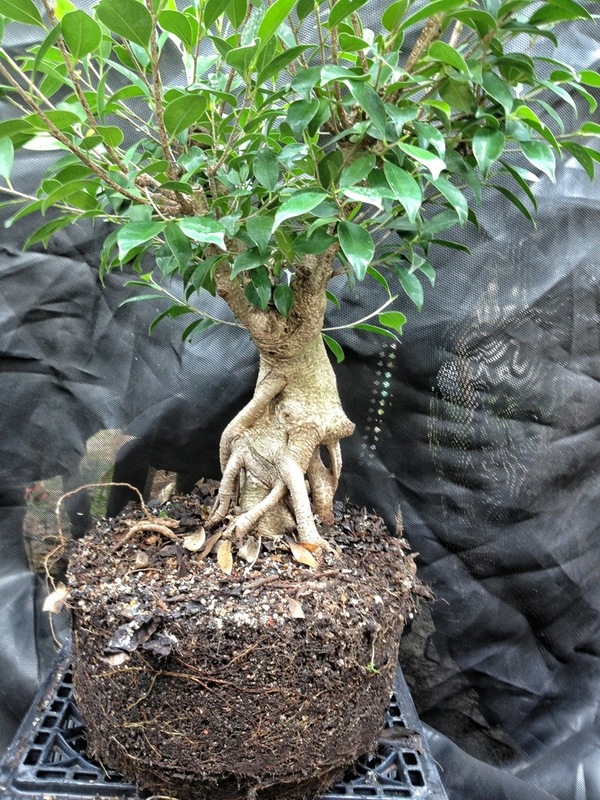 They are a good ficus to use as the internode spaces are short, the leaf is smaller and thicker than the regular f. microcarpa and they grow fast. Here are two I picked up recently. These are the bigger size. What is my vision for these two trees? I bought them for the bases. And regrow new tops on them. They will be a subject of an upcoming post on airlayering. One tree I’ll just chop and make a cutting. The other I’ll airlayer. 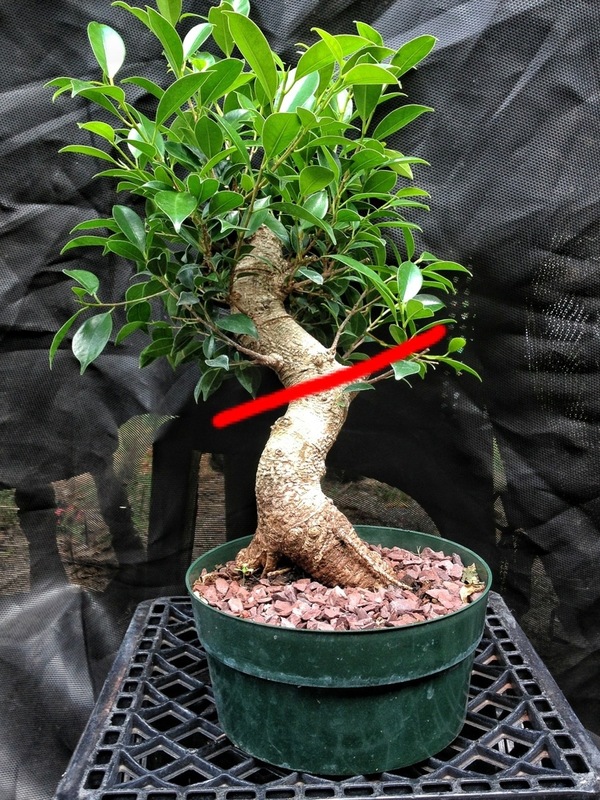 I’ve never airlayered a ficus because they don’t generally need it, a cutting this size is easy. But I’m curious to see what kind of results I’ll get. Stay tuned for that. This tree was an S-curve that was chopped and regrew. I did not do the trunk chop on this but it’s where I would have done it. 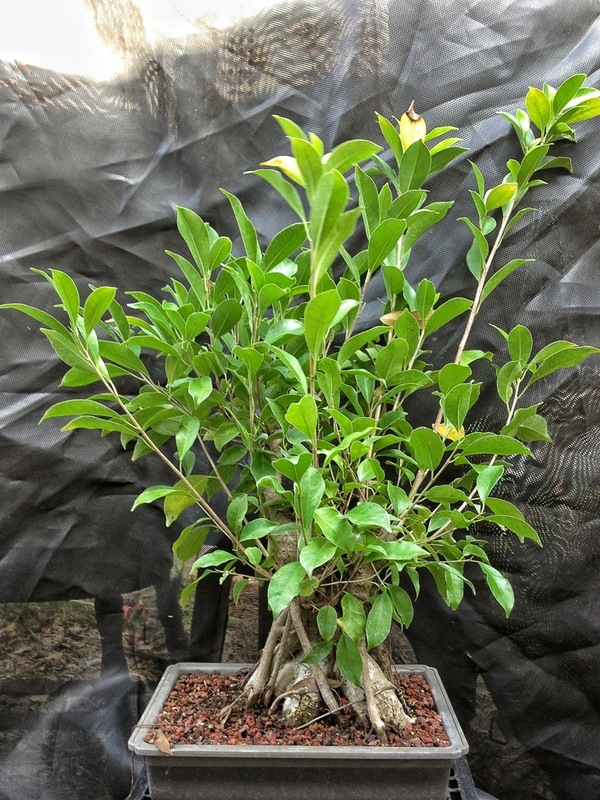 This was from a batch I got really inexpensively at a nursery that has declined recently. As a result, I’ve had to nurse it back to health a bit. This year will be its main growth year. The next S-curve is one I got years ago (maybe 5 or 6 years) and I paid too much. 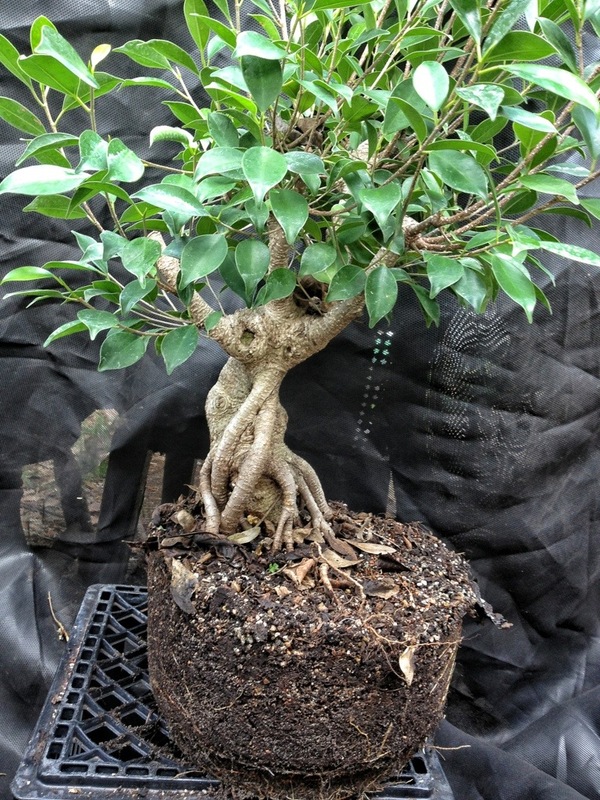 Having buyers remorse, I set it aside in a bigger pot and ignored it. So I cut it back once and let it grow. Not much of an S-curve left to it, is there? It’s probably 2/3rds bigger than when I got it. The red line was the original curve. 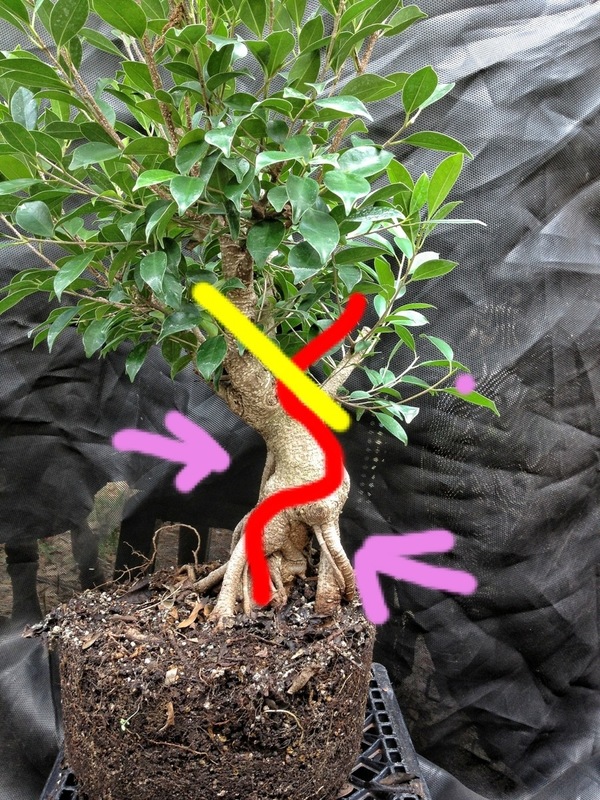 And the purple arrows show where aerial roots have grown down, erasing the curve. 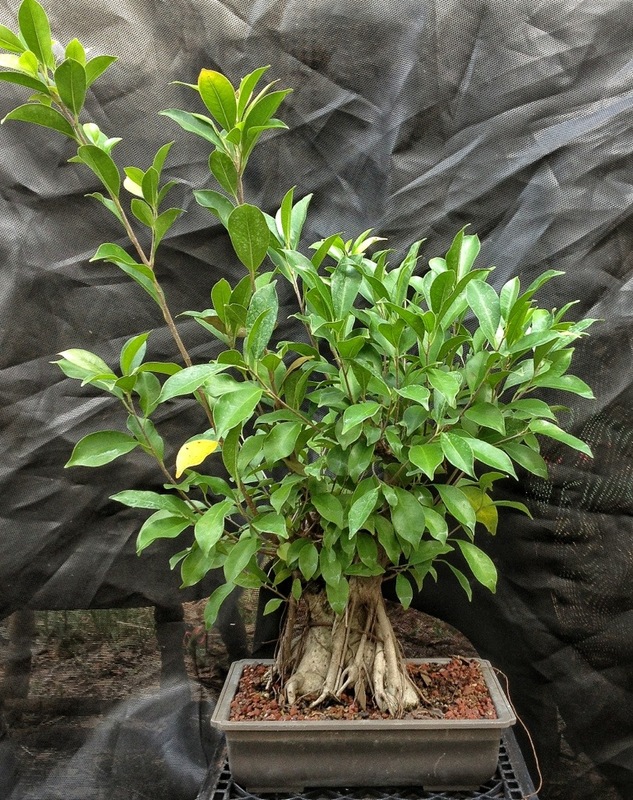 I plan on chopping it this year to start its way on becoming a bonsai. I did a post on this one here. 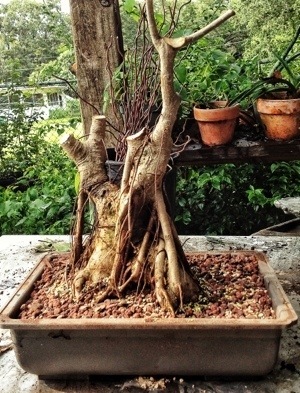 But this tree, well, it is also ginseng ficus. 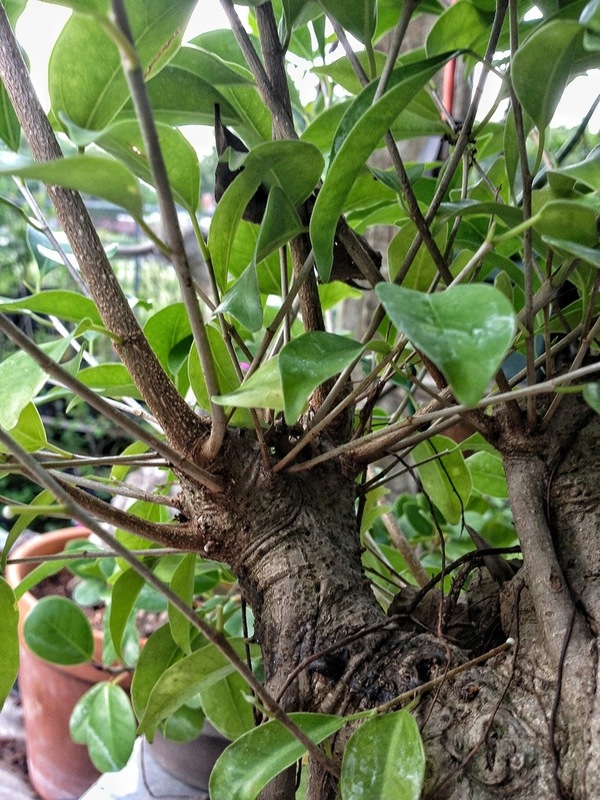 It has the same leaf shape, same bulbous trunk quality, same long internodes. If it looks, acts, and smells like…it must be. Back to our main subject methinks. You’ll notice how I filled in the spaces. 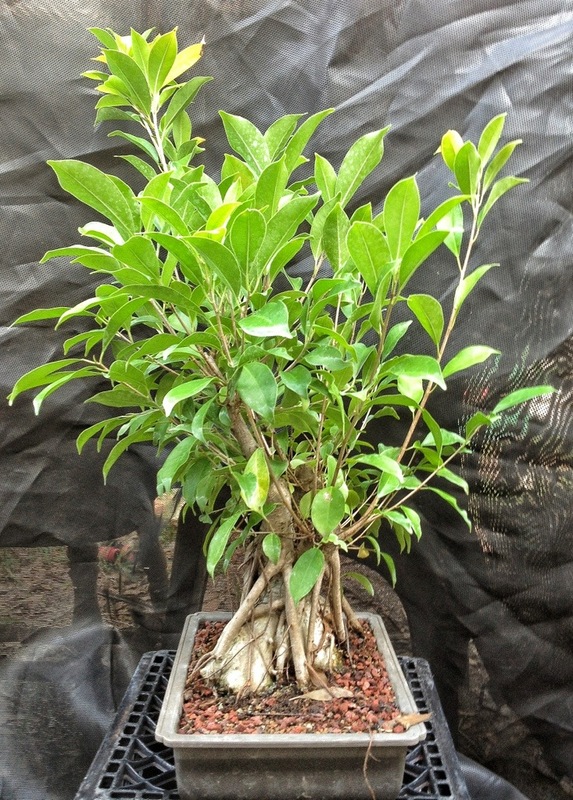 This tree will be a banyan style. The thing is, this is how it’s done. 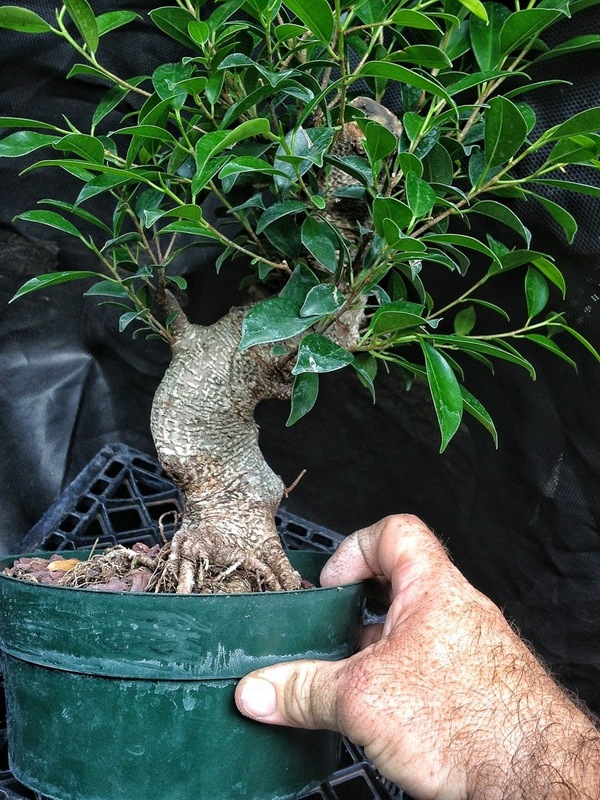 If you grow a ficus bonsai (or any tree) you have to have the vision for the tree and what it will look like 10 years from now. This, my friends, is the challenge and the difficulty that I, as an artist, seek. If I wanted something easy I’d be using juniper. Seriously. The juniper is hard for beginners (because they use such little sticks) but its the easiest tree as an advanced bonsai-ist. 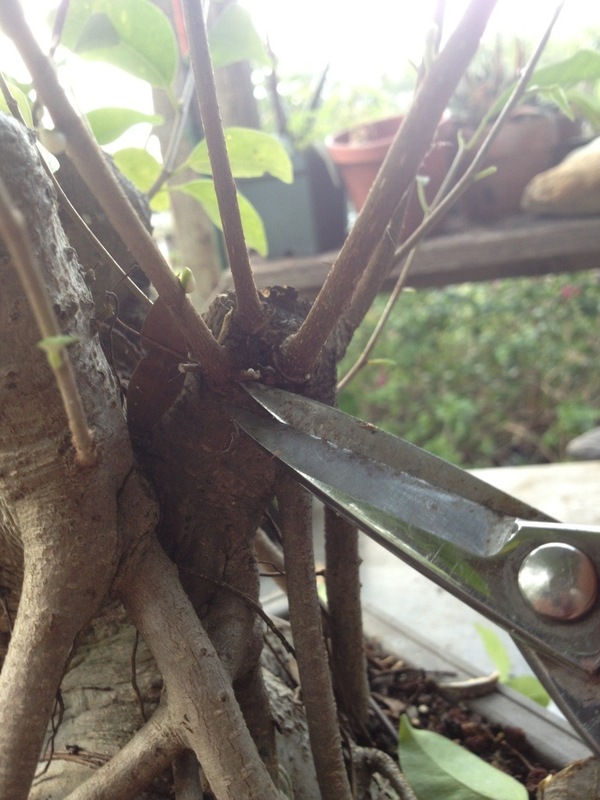 You might trim it twice a year, wire it once every two years or so. Keep it outside in all temperatures and the hardest thing; water it. 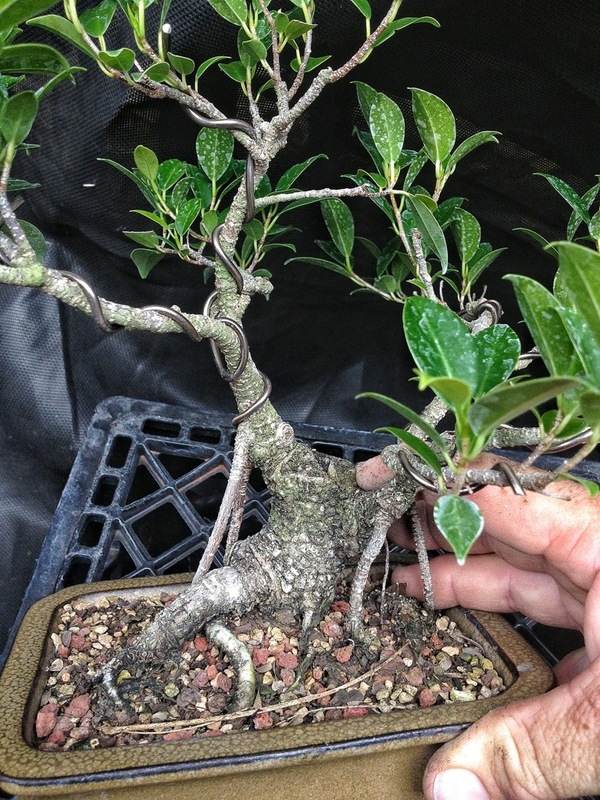 And when you style one,it has a very “tree-like” look already. 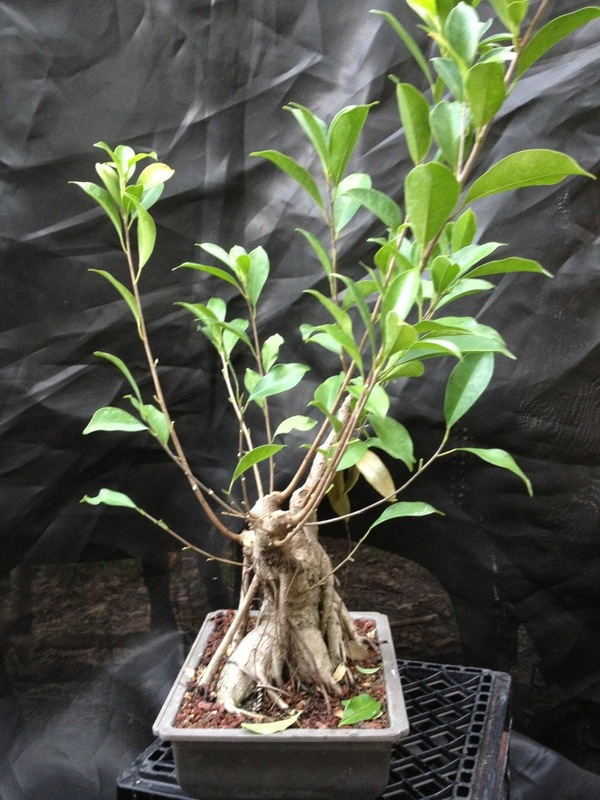 One only needs to arrange the branching and everyone thinks you’re a magician. 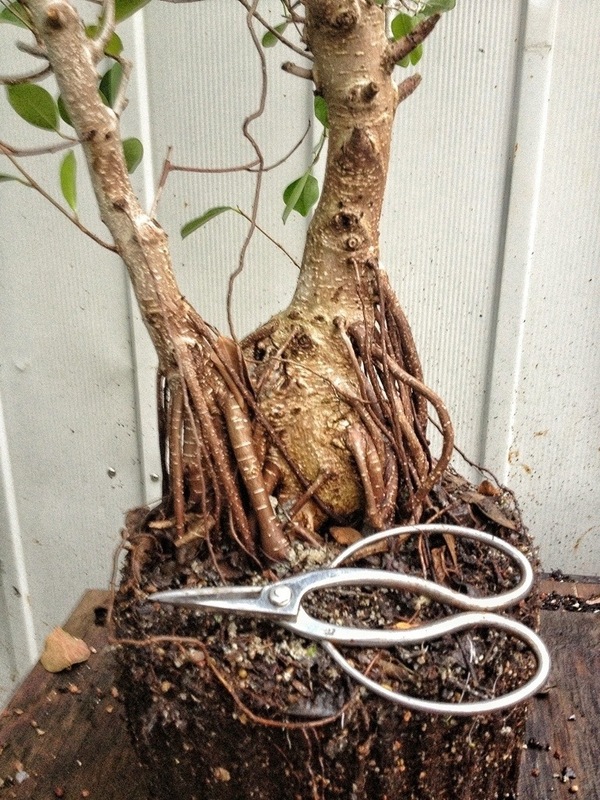 A ficus is WORK, wire, un wire, wire, trim, cut, chop, repot, every year. Etc. keep out if frosts, freezing, aphids, rust, thrips,whitefly…………ahhhhhhhhrrrrrggghhh! 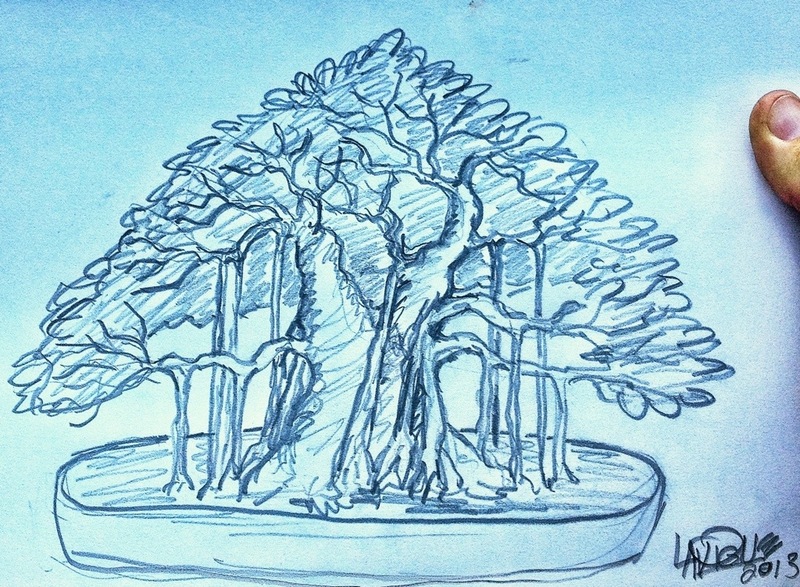 So, since I’m claiming to be an artist and that I have vision, where do I think this tree will be in, say, ten years? And here is what I see when I look at it. 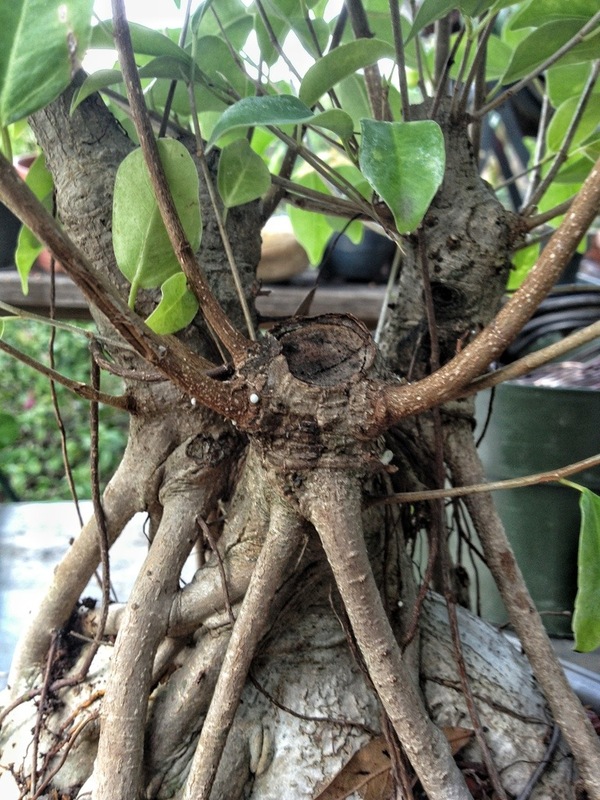 Well, the aerial roots are extravagant but, hey, they look cool. As always, I’ll post updates etc. 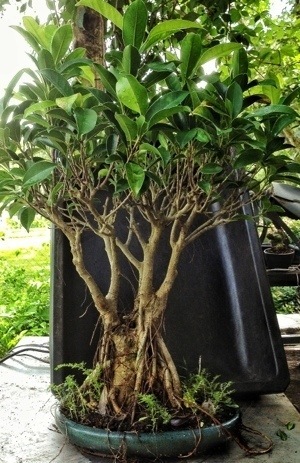 I’m quite sure if ficus grew in Japan, pine and juniper may only be footnotes. 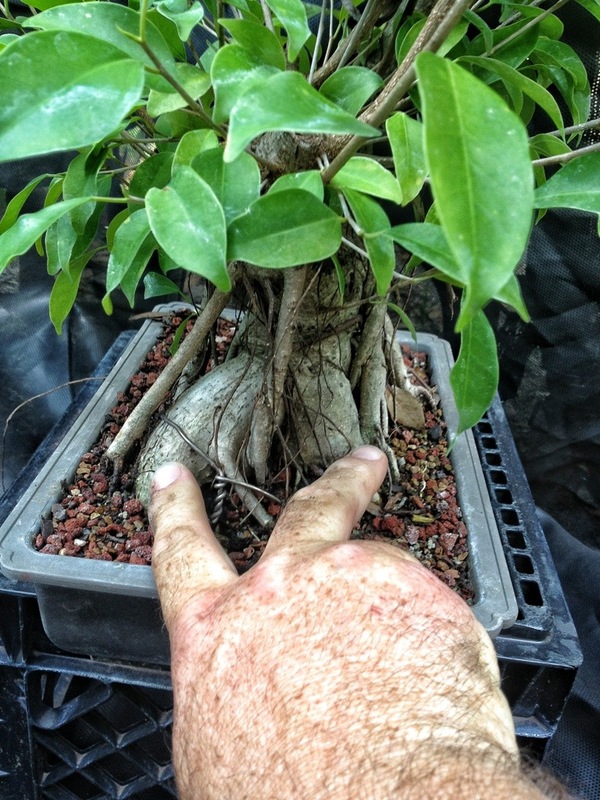 There’s a power to ficus that few can (are willing to?) appreciate. Thanks for sharing. Keep ’em coming. I love your work. 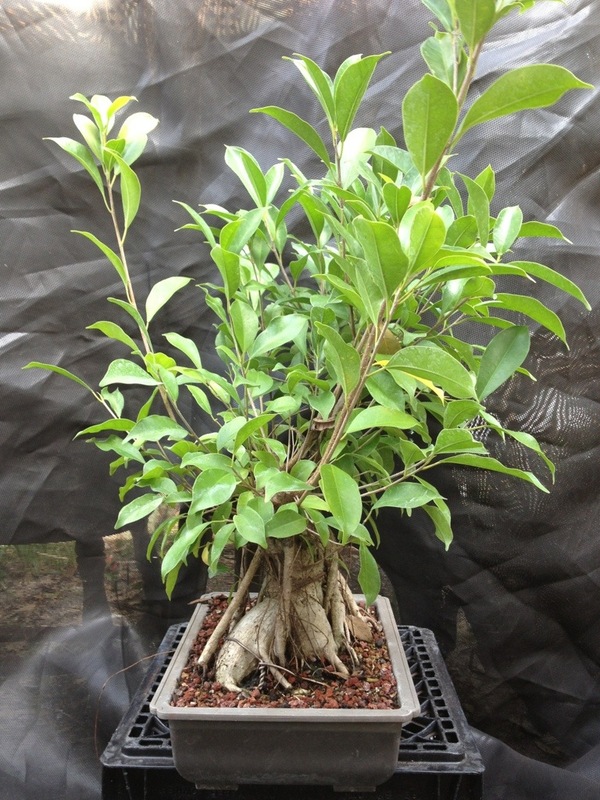 Man, I wish I could pay you to tree sit/develop a neriifolia for me! It’ll take me years to accomplish what you all can achieve in Florida in just one growing season – let alone two or three. Very entertaining read mate. Feeling inspired! 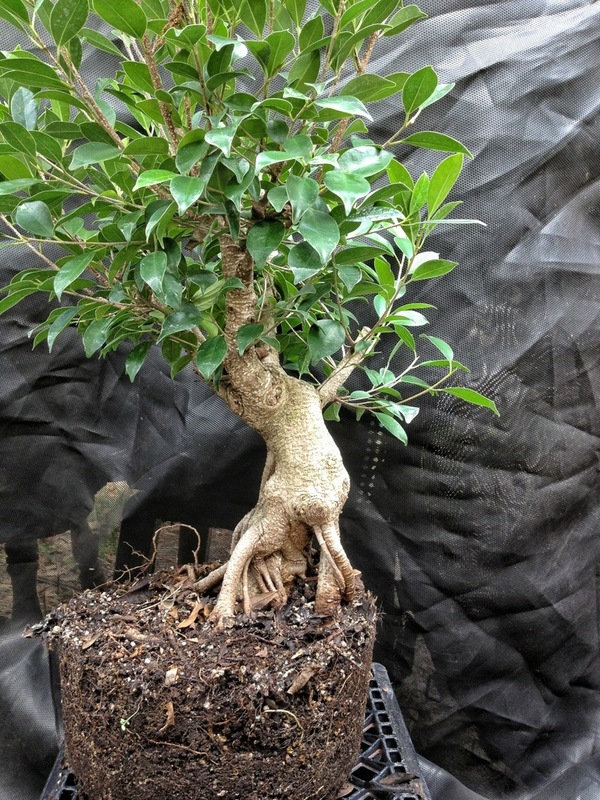 Hello, I just aquired a fairly large ficus microcarpa and I want to do a large chop on it. Do you think it is ok to chop it in September in Northern Virginia? Any insight will be helpful. Thanks. If I were you, I wouldn’t unless you have good lights and some kind of bottom heat system. A horticultural heating pad that is. 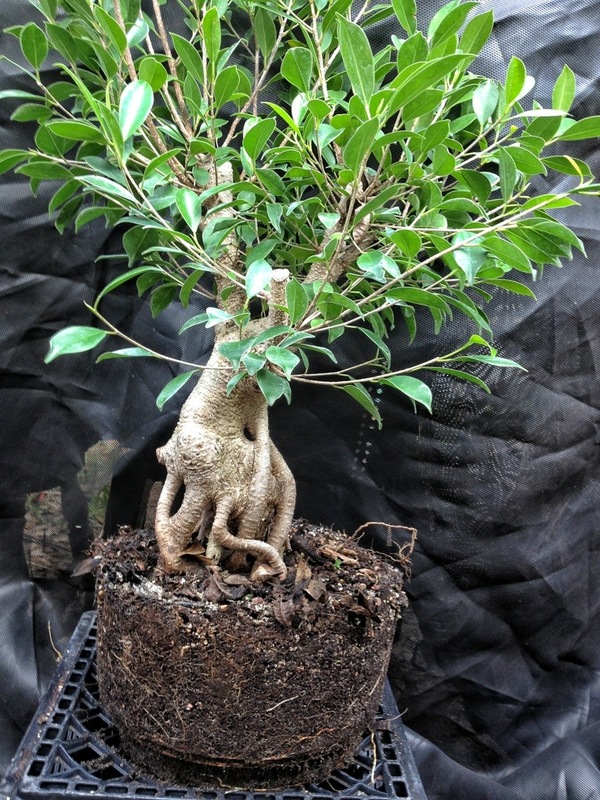 I am going to bring it inside with the rest of my ficus trees. It will sit beside a big window. Do you think that is enough? Or just wait? I say poo on the grumpy, stodgy, old men. 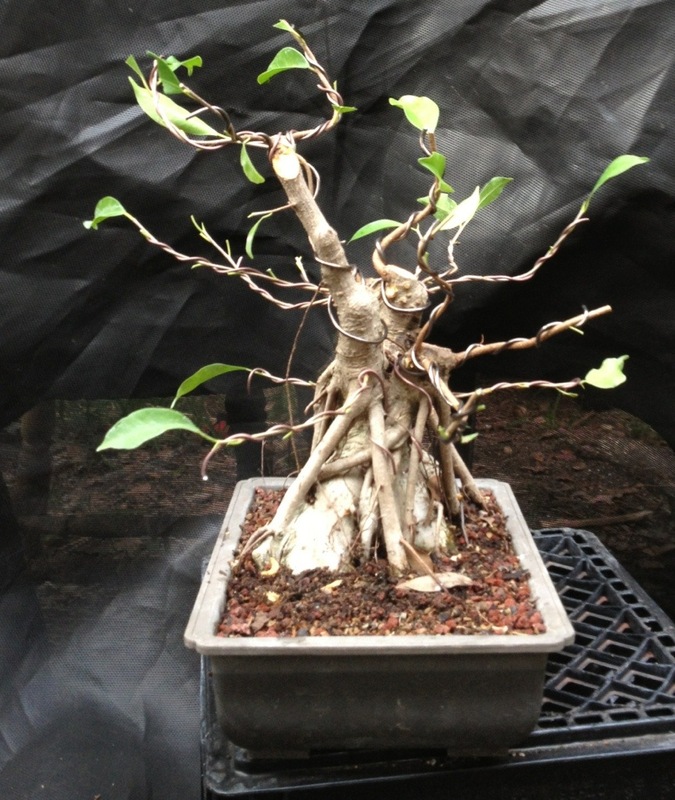 You are a magician with trees. Keep them talking and continue to have fun and change how we view bonsai!